We hope our new site designed specifically for Food Vendors and Retail Vendors will help you get started with a 1st class tent as your mobile store front. 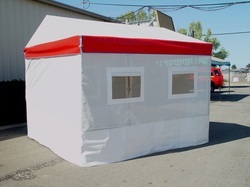 Take a visual tour of the many choices open to you to design a one of a kind tent at factory direct pricing. From the large selection of American made vinyls in many colors and the option of custom graphics, custom window placements along with endless color combinations you can have a customized tent to promote your business on the road. Serving food and retail vendors for over 32 years! 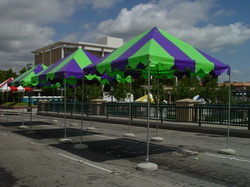 No matter how simple or complex, our expert team can create the perfect food booth tent to fit your mobile business. We work closely with you through every phase of design to ensure your complete satisfaction. Take advantage of our decades of experience. 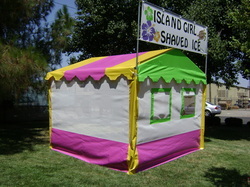 At A&L Products, Inc. you can custom design your Food Booth Tent with great bright colors, custom graphics, multiple serving windows, custom size windows, different frame styles, multiple anchoring options and much more. 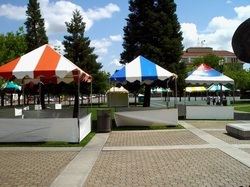 Inside view of 10 x 10 TRL 100 Food Booth Tent. Standard 24" serving windows can be customized for your particular layout.